When it comes to motorcycle insurance for young drivers, the most noticeable aspect is how the premiums are much higher for drivers under the age of 26. The reason for the higher rates is rather simple as statistics show that drivers below the age of 26 are far more likely to be involved in an accident. In addition, those who drive motorcycles are 26 times more likely to die in an accident than those who drive or ride in a vehicle. Wearing a helmet and appropriate clothing helps, but a motorcycle driver is exposed considerably when on the road. However, that does not mean affordable motorbike insurance for young people does not exist. In fact, there are many different ways you can find the best coverage at low rates that will fit into your budget. This is especially true if you are working your way through college or holding down a part-time job. How to Shop Cheap Motorcycle Insurance for Young Drivers? Finding cheap motorcycle insurance as a young driver starts with the manner in which you purchase your motorcycle. If you used a loan to secure the purchase, then you’ll be required to purchase comprehensive coverage which is the most expensive type of insurance available. This is a requirement by lenders so that their investment is fully covered. So, if you own your motorcycle outright, there are cheaper forms of motorcycle insurance for teens and younger drivers that can offer you some cost savings. Check out today’s rate by clicking here. State Minimum Insurance Coverage: 48 out of the 50 states require insurance for motorcycles and for the most part the minimum required is liability and uninsured motorist. You will need to check with your states rules and regulations to see what, if any additional requirements there are for motorcycle insurance for young drivers. 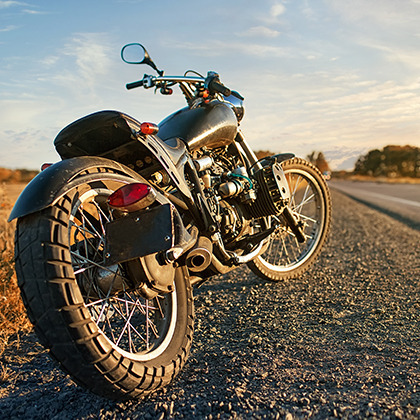 Learn more about the state requirement motorcycle insurance. Liability covers the other vehicle or motorcycle involved in the accident in case it was your fault. Uninsured motorist will cover you in case the accident was caused by a driver without insurance coverage. The combination of these policies means that cheap motorcycle insurance for young drivers is available as compared to comprehensive coverage. You may also consider collision coverage which protects your motorcycle in case it becomes damaged in a moving accident. Plus, there is theft insurance which provides monetary compensation in case your bike is stolen. However, adding these types of insurance will raise the premiums that you pay. If you are still in school, then you should look to see what student discounts are being offered. Many insurance companies will provide a discount if you maintain a “B” average or above. Otherwise, here are some other helpful hints on getting lower rates for your insurance coverage. Pay Annually: You can save by paying your insurance all at once rather than month by month. Many insurance companies will provide a discount that may be as large as one month’s worth of payments. So, if your insurance company offers a discount for paying for the policy in full, take it so that you can save money. Higher Deductible Rate: Even if you must take comprehensive coverage, you can always go with the higher deductible rate which can save you money on premium payments. It is best if you have the money required for the deductible in your savings account so that you can pay for minor repairs. Installing Anti-Theft Devices: Theft is one of the biggest issues that motorcycle owners will face and installing anti-theft devices such as padlocks, chains, immobilizers or alarms will help reduce your overall payments to the insurance company. Learn here how to prevent motorbike theft. Parking Motorcycle in Garage: Statistics show that drivers who park their motorcycles in garages are far less likely to have them stolen. This is because most thieves will not know you have a motorcycle or believe that it is too difficult to take if you keep it protected inside your garage. This can add a significant amount of savings to your monthly premiums. Driving Course: Most insurance companies will have a recognized driving course that you can take which will lower your premiums. Most courses of this nature will require a one-time fee, but taking it will mean that your premiums are lowered. Plus, the driving course you take many carry over to other insurance companies who also recognize it as well. For instance, if you are just over 17 year old and no previous record of driving, then having a driving certificate from authorized training institute is going to a big help as it shows that you have practiced and passed driving tests. Clean Driving Record: Drivers who have not garnered any tickets for traffic violations are statistically less likely to be involved in an accident. Therefore, maintaining a clean driving record is paramount to getting a lower rate on your insurance. This is particularly true for younger drivers who are just establishing themselves on the roads and highways. Limited Mileage: Those who drive below a certain number of miles on average will pay less because they are exposing themselves to less potential danger on the road. While an accident can occur at any time, it is statistically less likely to happen to someone who drives under 35 to 50 miles per week. So, check with your insurance company to see if you qualify for limited coverage as this is the perfect motorbike insurance for 16 year old drivers. Seasonal Coverage: If you live in a state that has substantial winter conditions, then you may go for months without riding your motorcycle. If so, then you can apply for seasonal coverage in which your insurance is only active for the spring, summer and early fall months of the year. You can save a considerable amount on motorcycle insurance for young riders as you only pay for the times in which the motorcycle is on the road. Engine Type and Size: The type of vehicle and size of the engine is also important. For example, dirt bike or moped which is usually smaller vehicles will cost low in premium. At the other end, custom built higher configured motorbike insurance is going to be higher than a standard 125cc bike. Thus, you can always start up with a standard motorbike and as you become more experienced, get better coverage especially after the age of 25.
Credit Rating: You also need to maintain a good credit rating which always indicates a positive sign about your financial ability. The insurance providers would like to sell their policy to those preferably who will be liable and enjoy their service for a longer period. Secondary Driver: If it becomes very tough to get your first policy in young age, then make your parents or relatives (who are very experienced and have maintained a good reputation as a driver) as first driver and you as an additional driver. This is how you can reduce the risk factors because as main driver is experienced thus there is less chances to fall on road accidents or involve in traffic violations. But be aware of fronting. You should not act as main driver or drive most frequently when you have added yourself as an additional driver only. This is a serious fraudulent activity that can result the cancellation of insurance policy immediately by the provider. Motorcycle insurance for teens is actually easy to obtain and if you follow a few tips you can save money on your premiums. The best advice is to work with your insurance company and find out their rules and regulations so that you can save as much money as possible. While motorcycle insurance for 18 year old may be considerably more than for a 30 year old, you can find yourself saving quite a bit of money by following the tips and suggestions above and working with your insurance agency so that you can get the most out of your policy while keeping more money in your pocket.